New floors, walls, double-glazed windows, electrics, plumbing and a new fosse all add to the living comfort of this house. Set on high ground with views of a small valley, it has an easy garden and its stone walls are recently pointed with traditional lime so require minimal maintenance. 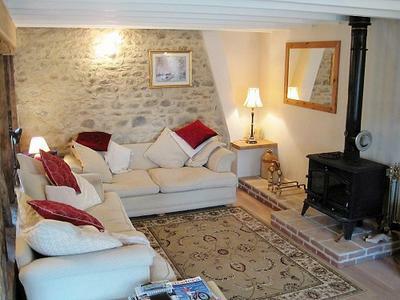 This pretty house is perfect to retire to or as a lock up and go holiday home having rural surroundings but within a three minute drive of a sizeable town. The front door opens into an open plan lounge with a raised hearth housing an 15kw woodburner, the heat from which goes up to heat bedroom one above; an open oak post “cattle stall” type divider creates a feature separating the lounge from the dining area. The dining area opens into a good sized kitchen, with plenty of cupboards, an eye-level oven and inset into an island is a large ceramic hob. 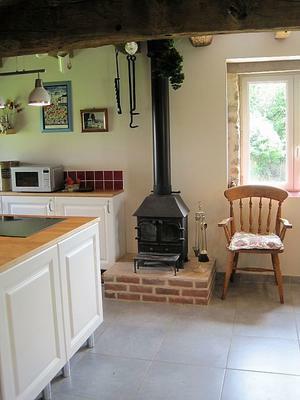 There is a small 5kw woodburner in the kitchen, the heat from which rises to heat the second bedroom above. The quarter-turn stairs lead off the dining area to a spacious landing, currently used as an office but could be reconfigured as a third bedroom. Off the landing is a large master bedroom with a dressing area having floor to ceiling wardrobes as well as a half-height full width storage cupboard; the second double bedroom also off the landing, has built-in under eaves cupboards half of which house the horizontal hot water cylinder. Also off the landing, there are two w.c.’s one with a shower cabin, electric towel rail and vanity unit the other with an electric radiator and vanity unit. Outside, a double open fronted cart lodge has room for two cars and with a blockwork lockable shed, provides a perfect hobby room. This lodge has a mezzanine floor giving a large area of covered storage. The pretty unoverlooked garden is of a manageable size (i.e. it’s not acres!) giving views down small a valley. 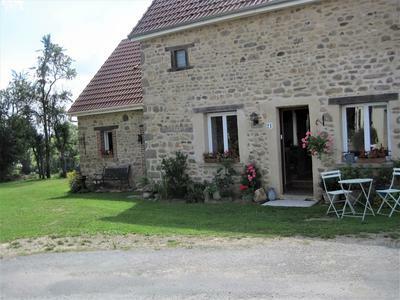 The property is about three minutes drive to La Souterraine, the main N145 East/West main road and about five minutes to the A20 North/South main road.